On 6 November, the Russian top brass’s dream came true: President Putin dismissed Defence Minister Anatoly Serdyukov, whose ongoing and fundamental reform of the Military has perhaps been the only real reform of the last ten years. Military analyst Aleksandr Golts looks at the issues that confront his successor (photo: RIA NOVOSTI Agency). There is a striking similarity between the recent conspiracy surrounding the former Defence Minister Anatoly Serdyukov and the strategy adopted by the Russian police against opposition leaders. Early on the morning of 25 October, Russia’s Investigative Committee (SK) announced that they had conducted a search, and seized documents at the offices of ‘Oboronservis’, a military contracting company set up by the Defence Ministry. The SK’s official spokesman Vladimir Markin announced that criminal charges were being brought against five senior managers at ‘Oboronservis’. The five are accused of deliberately undervaluing Defence Ministry assets and then selling them to companies linked to Oboronservis. Only a day earlier, Markin had been in front of the press denying that a confession by opposition activist Leonid Razvozzhayev – later retracted - had been extracted from him by force. Soon afterwards the website Lifenews.ru, which regularly leaks transcripts of tapped opposition phone calls, posted a story about Serdyukov being found at the flat of the Ministry's former property department head, Yevgenia Vasilyeva, during an early morning police raid. Oboronservis was set up three years ago to manage all repair and maintenance operations at the Defence Ministry: the servicing of military equipment at plants owned by the Ministry; the maintenance of military terrains; the supply of food for military personnel; heating systems on army bases and so on. The aim was to free army commanders from responsibility for these ancillary areas and allow them to concentrate on training the troops under their command. It also meant that the military, including its highest echelons, lost any access to the financial resources connected with these areas, a development that not surprisingly raised a lot of hackles. Former Defence Minister Serdyukov in Parliament. The strategy Russia’s political clans used to get rid of him was not unlike the way the regime fights the opposition. Apartments were searched and documents confiscated; criminal charges brought against his subordinates were leaked to the press, all paving the way for his dismissal (Photo Grigory Sysoyev, RIA NOVOSTI Agency, all rights reserved). Oboronservis’s activities are of course in no way above suspicion. It goes without saying that many of its employees are lazy and corrupt, and that the scale of the temptation before them increased exponentially when, as part of its reform, the Defence Ministry started selling off army assets, which included juicy bits of real estate and buildings in and around Moscow. The company’s structure is nevertheless much more transparent than what preceded it, based as that was on state owned monopolies under the direct control of the ministry. At least Oboronservis has to present an annual report, have its accounts audited and so on. And in any case all the accusations are founded on a subjective assessment of the value of the sold-off assets, claimed by police experts to be underestimated. So what we see is accusations of corruption against people closely connected to an object of harassment, followed by leaks to the tabloids about a minister’s private life. The whole thing reeks of a put up job. The go-ahead for a job like this must have come from somewhere at the top. The main question is: how close to the top? It’s unlikely to have come from the president – Putin has always shown every support for Serdyukov’s reform plans. Also, after the presidential election, the Defence Minister made it clear that he would be happy to step down, so Putin could have let him go at any time without fear of objections on his part. And it is certainly not in Putin’s style to go grubbing around in his associates’ dirty linen. This whole affair looks like a conspiracy among some members of the Putin inner circle. The media are pointing the finger at a number of suspects: the president’s head of administration Sergey Ivanov, angry at Serdyukov’s success in carrying out the military reform that he himself bungled earlier; the deputy PM for the defence industry Dmitry Rogozin, who couldn’t spend a ha’penny without Serdyukov’s approval; and the head of the state owned Rostekhnologia corporation Sergey Chemezov, who has been carrying the can for the failure of defence contracts. The success of the conspiracy reveals that Putin’s Byzantine rule is not what it was. I still have no doubt that it was not the president who brought his minister down. If he had wanted to get rid of him he could have done it earlier, when Serdyukov was keen to go. What’s more, he pointedly received him at the Kremlin for everyone to see on the day of the police raid on Oboronservis’ offices. In the old days that would have been a clear signal of support: it is well known that Putin does not give audiences to lambs destined for the slaughter. But the signal failed, as became apparent when the central TV channels all led their main news programmes with the story, couched in openly anti-Serdyukov terms. It appears that the elite clans have begun to engage in internecine war without even asking Putin for permission: he is just presented with a fait accompli. The appointment of Sergey Shoigu in Serdyukov’s place was obviously dictated by circumstances. Why else move him from the post of Moscow region governor that he had only held for six months? Presumably Shoigu was the last, if not the only, player left on Putin’s bench, as well as the only person left whom the president could trust. New conscripts in the army cafeteria in the Siberian city of Omsk. Reforms initiated by the former Defence Minister Anatoly Serdyukov meant the professionalisation of the Russian army in the foreseeable future, discontinuing its annual draft of young conscripts (photo: Aleksei Malgavko, RIA Novosti Agency, all rights reserved). What will become of reform? The second question around Serdyukov’s dismissal is the fate of his principal project: reform of the army. The main point of this was not of course in the halving of officer numbers, with the loss of 200,000 jobs, and a general shrinkage and streamlining of army structures that included the replacement of unwieldy divisions with smaller brigades. The reform indirectly led to the complete rejection of a concept that had ruled for a century and a half, under which the country’s defence was to be ensured by the mass mobilisation of reservists. In Soviet times, the government’s plan for any ‘period of threat’ was the call up of eight million citizens, and this idea still lay at the heart of Russia’s defence strategy when Serdyukov began to plan his reforms. The officers made unemployed by the reforms would be needed to command the regiments and battalions of reservists. And the superfluous decommissioned divisions would be needed to receive these reservists and provide them with arms. However, the war with Georgia in 2008 exposed this whole concept as unworkable. The greater part of the tanks and armoured vehicles taken out of storage bases were incapable of getting to South Ossetia. And the regimental commanders who had spent their careers in units at reduced strength simply refused to lead troops into battle, since they didn’t know how to command. One strand of Serdyukov’s reform was for general-purpose troops to be used only for local wars. If this were to be successfully realised, it would sooner or later have implications far beyond the military sphere; it would fundamentally alter the relationship between the state and its citizens. Announcing that even in a war situation the armed forces would need no more than 700,000 reservists, the Russian government was, for the first time in three centuries, renouncing its view of its citizens as, essentially, its soldiers, a change that would in the long term undermine one of its central principles – state militarism. At the same time it was clear that the ‘quantitative’ stage of military reform (the dismissal of hundreds of thousands of personnel and reorganisation of the army) was one thing, but the ‘qualitative’ stage was quite another. Because, as the reform went through its successive stages, it came into ever greater conflict with the core principles of the Putin regime. So, for example, the next step would be to abolish conscription. There is no point in forcing about half a million young men through a year of military service if they are not going to be needed in the future. Conscription only makes sense if Russia is committed to having a million-strong army. The demographic situation, however, precludes that in principle: only about 600,000 young men reach the age of eighteen each year. That is the precise number of conscripts needed annually if troop numbers are to be maintained at 1,000,000, so every eighteen year old would need to be packed off on military service, including students and those who would usually be excluded on health grounds. The figures just don’t add up, but the senior figures at the Ministry of Defence have baulked at explaining this to their Commander in Chief. Even now the number of Russian troops is only somewhere between 700,000 and 800,000, and the situation will only get worse. At the same time, brigade strengths are calculated on the basis of a 1,000,000 strong army, and despite the reforms there is already a discrepancy between apparent and real troop numbers. So the new, reorganised, structures are no more combat ready than those of the 1990s. In a year or eighteen months time the Minister of Defence and President will face a dilemma: either to announce that Russia can’t afford an army of more than 500,000 and gradually replace conscripts with professional troops, or to maintain at least the pretence of a million-strong army, for which they will need to increase the length of compulsory military service from one to two, or preferably three, years. Where will the tanks come from? Another, perhaps the most significant, threat to reform, is an ambitious re-equipment programme, budgeted at 23 trillion roubles, which the Russian defence industry is in no state to fulfil. The money will of course be allocated and spent, but is it highly unlikely that the army will be supplied with the planned number of aircraft, tanks and missiles. Today’s Russia has still not developed a manufacturing base for the components necessary for complex armaments, which in Soviet times were produced at civilian factories specially licensed by the MOD (and where market forces naturally played no role). In the 90s these factories either closed or were converted to other types of production and, despite loud promises from its leaders, the military industrial sector is in no state to undertake the mass production of military technology, for the simple reason that the necessary components will still have to be partly hand-built at assembly plants. However much cash is injected into this sector, the production costs of the finished product will inevitably rise. All this is perfectly understood by all the people involved. But they can’t admit it, because then they would have to admit that this ambitious re-armament programme costing 23 trillion roubles is an impossibility. Even this enormous sum is insufficient to develop an integrated and coordinated industrial sector capable of producing the complete range of military equipment from pistols to intercontinental ballistic missiles. It would require a higher level of cooperation than can be achieved with the gigantic collective farm-like enterprises known as state corporations. These are not the place for efficient production: the income earned by some will be reallocated to others that have gone bankrupt. On the other hand, who will risk questioning the decisions of the national leader? 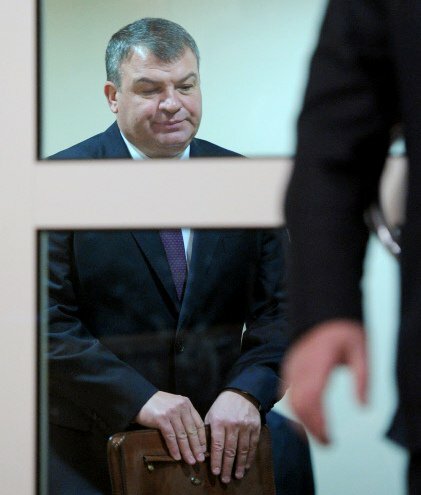 Serdyukov could not publicly admit that the Putin system could not deliver the goods, although at the same time he didn’t want to be responsible for the fact that enormous sums of public money would be squandered, with nothing to show for it. So he doggedly argued with defence industry chiefs, trying to make them analyse the cost of products and develop the technology that would be useful to the army, rather than what would be profitable to the industry. This conflict was the real reason for Serdyukov’s fall. Will new Defence Minister Sergey Shoigu be up to the challenge of this legacy? There is no doubt that he is one of the few senior Russian officials willing to accept responsibility; he also has enormous experience and is known for his administrative ability. One of his undisputed achievements was the creation of the Emergency Situations Ministry, where he took troops of the Soviet Civil Defence, for decades a punitive posting for disgraced officers, and turned them into a real Search and Rescue operation, people proud of their profession, motivated and self-confident. 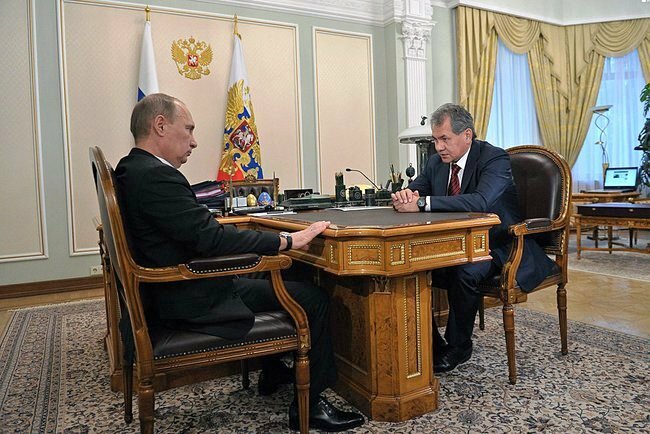 Sergei Shoigu, one of the few popular politicians of Putin’s team, was unable to hide his surprise about his new appointment as Russia’s Defence Minister at a meeting with President Putin (photo: www.kremlin.ru). One would like to hope that the new Minister of Defence will quickly get his head round the situation and be able to stand up to the generals whose main aim in life is to see the reforms dismantled. However one can’t exclude the possibility that events demanding in theory a new line from the new minister, may themselves force him to make new changes to existing good reforms. It is more than likely that the generals who have been muttering in corners for the last four years will try to take advantage of the situation and persuade Shoigu and Putin that Serdyukov was taking the wrong course; that the old Soviet model was the right one, that the demographical hole can be plugged by extending military service to two, or preferable three, years. Alas, in Russia one can never say that a reform has reached the point of no return.